The Lubeznik Center for the Arts, near the lakefront in Michigan City, Indiana, is available as a unique, affordable setting for a variety of events: corporate, social, cultural or personal. The vibrant presence of fine art, photography and sculpture will add a special dimension to the occasion, making it memorable for you and your guests. Whether your next planned occasion is a champagne reception, wedding celebration, formal dancing gala, business retreat, social tea, or a children’s birthday party, we know your event is important to you. We also know that the location, ambiance, and facilities all play a part in making your special day a success. The architecturally iconic Lubeznik Center stands on beautifully landscaped grounds. Major shopping, recreation, full service hotel and charming bed and breakfast facilities are located nearby. 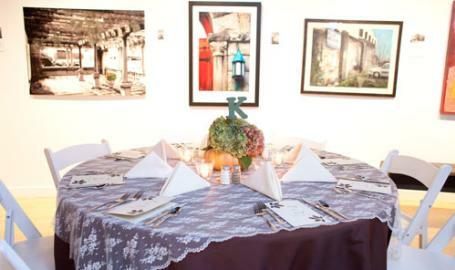 The galleries of the Lubeznik Center for the Arts will frame your event in a picture-perfect way. Description Standing on beautifully landscaped grounds just steps from Lake Michigan, the architecturally impressive Lubeznik Center for the Arts is conveniently located near a wide range of shopping, recreation, dining and lodging options. 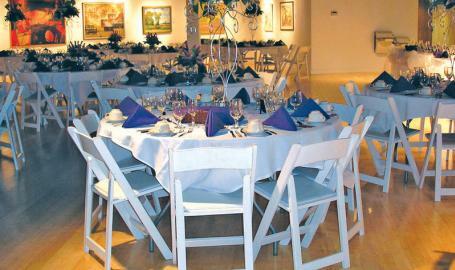 Featuring constantly changing art installations, flexible spaces for entertaining, gatherings and meetings include: The stunning 2500 square feet, semi-circular Hyndman Gallery can accommodate up to 250 people for a cocktail party or up to 150 for a sit-down dinner party. The 1000 square foot 2nd floor areas including the Brincka/Cross Gallery, with a dramatic domed skylight, the Conference Room Gallery and Robert Saxton Gallery, will easily accommodate up to 100 people for a stand-up event. Each can be rented separately for lectures or discussions. The 1000 square foot NIPSCO Art Education Studios are ideal for classes, small business gatherings, or Art Parties for children or adults. The entire Lubeznik Center facility has more than 5000 total square feet on two floors for grand events. Stand-up capacity is over 200 people. The front patio can also be utilized for seating and the tree-lined North parking area can be tented to increase capacity in warmer months. Free and ample parking is available on site. Tables, chairs, sound, lighting systems and visual aids can be provided for an additional charge.